My score was up almost 100pts over last year. Don't know if it was because we didn't have to walk down and score targets or the week of dry firing I did last week. One thing I liked besides the obvious, the printout of every target I shot with shot order. Sounds encouraging, did they require a "verifier". dennymac wrote: I shot the match as well. The folks there are good people. The facility is well thought out, and has very few issues. I made a few suggestions that might help, but they are small issues. I had a round that did not score in a rapid fire string with a .45, and I am certain that it went through the middle of the target. 10 points gone. But, it was a shakedown event. All in all, I will go back for another match. 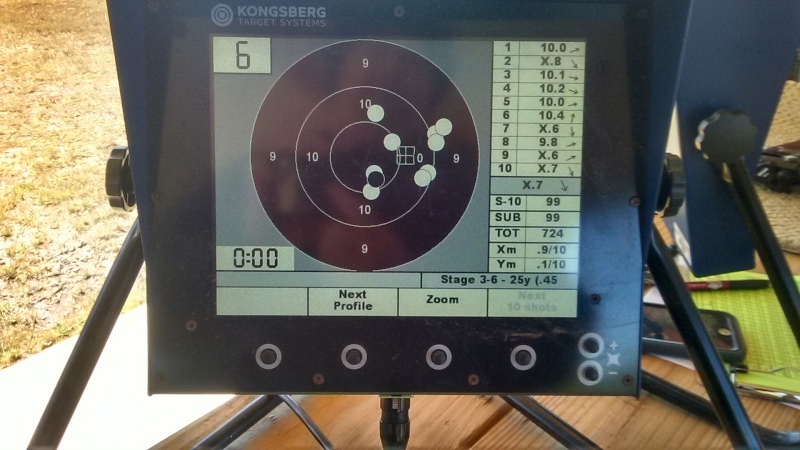 DennyMac"
Got to love technology and the advancement of Bullseye/ Precision shooting. How long is this "shakedown" process going to take ? They did not have a 'verifier' on site. We did have score sheets to write the scores on, but I do not know why. The hand written score cards were not collected. And, the score from one string was cleared from the monitor so fast that I did not get a chance to record the values. I wrote that off to 'new to the pistol matches and commands'. We all have to learn new things. One thing that I noticed was that the 5th round did not score in a first string on one of my timed/rapid targets, I forgot which one. After we fired the second string I went to find a range officer and notify him. His first question was 'Are you sure that you fired 5 rounds?" I seem to recall that the string eventually scored 10 rounds, and I figured that the computer might have just had to do a little more figuring before it displayed. OK, not a big deal. There were several instances when the shot did not display instantly, but came up in a couple of seconds. Later, after I had a chance to study the printouts, I found that there was a target that had only 9 rounds scored, on a different target. Again, all in all, it was an enjoyable experience. But, I am not certain that there is ever going to be 100% confidence in the electronic scoring. After all, absolutely nothing can go wrong, beep whirrr- can go wrong, can go wrong, can go wrong, can go wrong, can go wrong! The HAL 9000 will notify you of your adjusted score. Good reference! I am sure that you guys know how HAL got his name. It is one letter down in each position from IBM. A sense of humor is required. Brian Zins "it didn't score the 10th round!" R.O " are you sure you fired 10?" 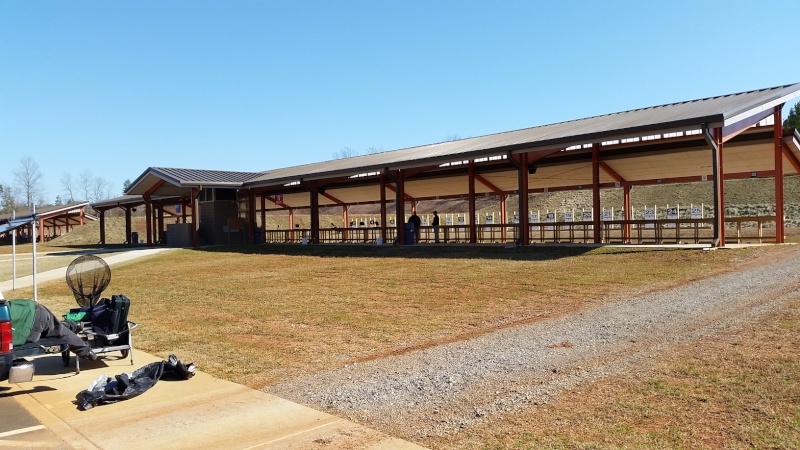 The target system is also used at the CMP South Competition Center in Anniston. I like it for air pistol and Slow Fire as it displays a calculated center of group on the display, making it easy to check your sight adjustments. With air pistol if the center keeps hovering around the X ring I'm good to go. Since this was the first event I shot after mounting a red dot on my 45, I took pictures of every target and graphed my group centers afterwards to confirm a reasonable zero on my red dots. Pretty cool being able to see that the short line needs three clicks up and two right for my ammo and my consistent flinch. When using the targets for Timed and Rapid Fire my 25mm Ultradot covered the lights on my target, so I had to watch for the lights on targets on either side of my target. There were several shooters that often fired before the lights changed from red to green during Timed and Rapid Fire. This match went better than the Service Pistol match back in December. Service Pistol was pretty rough on the target frames. I know I hit the plastic frame several times then, and I finished near the middle in the roster. This time I had one miss with the 45, just outside the 5 ring at 7 o'clock. The location didn't display on the screen but was shown on the scoring print outs. I think I like paper for Timed and Rapid Fire on a turning target. How am I going to post a clean target on my shop wall? I was joking with a friend about one of us shooting our first clean here, what would we do, take a pic and print the pic? Well as luck would have it, he did shoot his first clean. Yes. There were lots of early shots and several late shots. I shot the match too, very nice range, my observations... Not everyone will have a good experience, range info stated you must be a sharpshooter or above to compete but Sarah the match coordinator said that was a mistake and marksman would be included in future info, that said I'm sure as marksmen many have hit the target frames which is a big no-no, do it twice and you are DQ and asked to leave the line. Transition from turning targets to red and green lights were not a problem for me but as the day went on I heard many shots go off while the red light was on so clearly some were having problems. The match segments moved a little fast imo for old guys who like to sit down for a minute or two while stragglers finish scoring. The benches were a little narrow, my gun box (strong box) would barely fit all 4 feet on it. They passed out paster's to repair the paper part of the targets but they never asked us to do it. 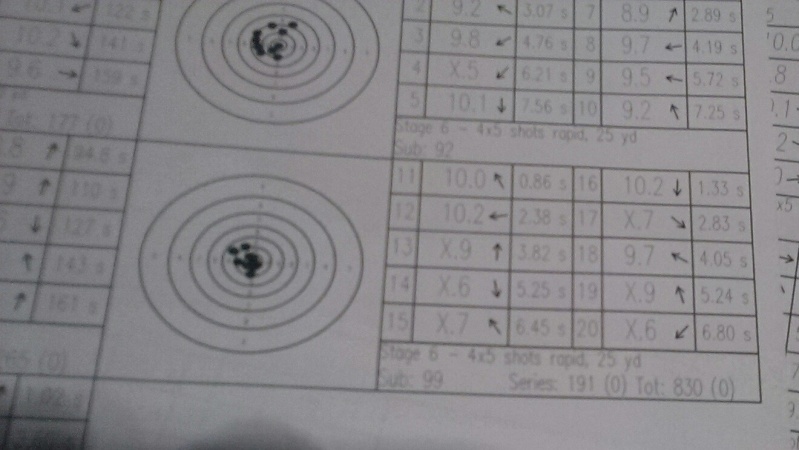 By the end of the match you could easily tell who the better shooters were by the condition of the white paper. I'm not sure how the black center works but I did see daylight several times when my 45 bullet went thru it but it disappeared fast. They made us swap our drivers license for a gate pass which did not work but they have a call button on the gate that worked to call and have them open it. Great range, targets at 50 and 25 are motor driven and one folds down as the other comes up, they worked good except for a few problems with lights that went out. Not that easy to find, my gps would not find the road name and they have very limited signage on the in coming roads and I-20 but basically its behind Talladega speedway about 3 miles. All in all a very good time and I will go again. I also shot well except for my 45 acting up near the end and loosing 3 shots to a double alibi. Couple of pics I took. Ok I will let you in on a tip from one of the AMU shooters on the red and green lights, while the range safety briefing was going and they talked about do not fire till the green light comes on, The AMU shooter whom ive shot with several times over the years leaned over and said... forget the green! Shoot when the red goes out! The red light and the center of the bull both show perfect in the red dot, I did this and it worked great! I watched red light also through my match dot.I had a late shot center rapid fire, only shows the 9 shot in the time limit. Timer for slow fire is on screen. No need for stop watch. Also if need to adjust zero on short line. Shoot first 5, look at monitor and adjust. No jumping up to scope to look before target turns away . Ryan Franks asked me for a plug, to check a shot of his, silly guy. Screen had a zoom mode, from srd mode of cluster of shots to zoom into black, then down to x ring. Computer system in tower figures alibi. Screen clears for alibi string, shoot alibi,5 shots easy to find cluster shots. Brian Hunter shot rifle range on Saturday. The target on the screens don't look like nra b6,b8. Christopher Miceli wrote: The target on the screens don't look like nra b6,b8. We shot on B6 and B8 targets. With the zoom button you can zoom in to see just the black rings or just the 10 and X rings. I forgot about the zoom and kept mine on all rings, since I still use all of them from time-to-time. 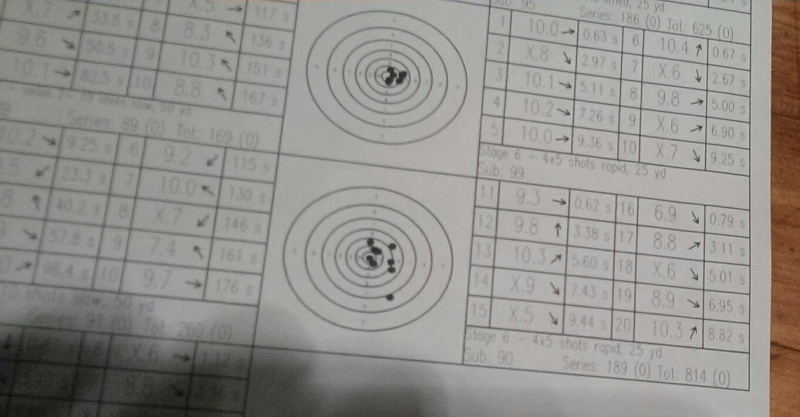 In air pistol I usually zoom to just the black rings. The picture I had in my post was some generic metric rifle target. Can you see the lights through a 1" Ultradot? Also, how long did it take to shoot the 2700? I'm sure you could shoot a 2700 in under 3 hours on electronic targets. I'm sure I wouldn't want to; I shot an 1800 in 2 hours a few months ago and I damn near had to carry my shoulder home in a paper bag. I agree with John Bickar. I wouldn't want to shoot a 2700 in one go. Alternate relays for each 900 . With a 15 minute changeover time between relays. A 2700 in one day is a marathon anyway.